7th house Pisces is usually prolific for marriage but Jupiter is in a barren sign, Moon is not great, Jupiter squares Saturn and Venus is in aspect with Saturn and under the beams and out of sect, so marriage is difficult, delayed or just denied. I was going to save what follows for when I revealed the native, but now seems a good time. Don't make way too much of this because it is largely personal opinion even though it seems to apply in this case. The older I get I think less and less of the idea of 10th house indicating career. It may well indicate what we might be well suited for (and at this point I'm no longer even willing to automatically grant that), but we always don't find a suitable career. I prefer Morinus' use of the 10th as the place of "honors" and I would modify that for our time by calling it "recognition." Morinus lived in a time (17th century) and a place (Paris, France) where "honors" meant money from a king or nobleman that was necessary to advance in the world, in the professions. Patronage ruled. So when he says "honors" he means recognition that leads to advancement. And let's face it, recognition in our lifetime often does lead to advancement. Tennis champion Arthur Ashe had the Sun on the MC and other 10th house/ASC stuff that indicated recognition (fame?) would come to him in his life, and it did first in the form of a Wimbledon Singles Championship and later as a civil rights advocate. If we didn't know he was a world class athlete, "tennis champion" might not come to mind when looking at his career, but we could see that he would bring honor to himself in his chosen field. Our native is or was in a similar position. There is no specific significator, that I'm aware of , that gives away why he became well known. In fact his fame became a source of inner conflict. And the reason he became well known was not for illegitimate activities. He's no criminal. Some jobs are more easy to see than others. For example, the high wire guy had a strange job and no one would look at his chart and think of a high wire artist, but there are still things there that make sense and suggest a performer and athlete. I agree that some charts are unclear regarding career, such as aptitude versus reality, but there are cases that are more obvious than others. Celebrities are probably some of the best examples because their careers are very public and focused on the 10th. Some people are focused on one area and it is very specific while others dabble in various things. My own chart is a good example, since it has all sorts of stuff going on there - and someone could just make the comment that I am all over the place with job types and that would be correct and valid. I do think in most cases there will be emphasis on something, even if that emphasis shows lack of focus on career. Often people with a lot of planets below the earth may not care much about career, for example. People with luminaries in the 10th, such as this person, often have very public occupations and just knowing that tells you something about their career, even if it doesn't say the job title. Usually I find the 2nd helps with the 10th to describe occupation because the 2nd is what supports us. if he is who i think theres no birthtime at astrodatabank,are you sure the time is correct? I don't know who you think it is, but all will be revealed in time. Again the object is not identification, but application of technique. If we get things right with appropriate technique, does it matter, for the purposes of the exercise, if the birth time is off a bit? Practical application not personal identification. I don't think the chart can show "your job." Mine sure as hell doesn't and it isn't too descriptive of the type of work I did, probably because it didn't exist when astrology was developed. Using the temperament, and some of Lilly's suggestions we can deduce a few characteristics that might be useful in a variety of work or even exclude some fields. For example, a highly choleric individual is unlikely to make a great research scientist. He doesn't have the patience. But a highly choleric individual would make a good sales manager, athlete (assuming the requisite physical gifts), entrepreneur in any of a number of fields, soldier, etc. Can we take the chart of highly choleric individuals and pinpoint their career? I doubt it. We might nail one now and then, but the precision to distinguish each and every job just isn't there. Lilly had a system that probably worked well in his society. Pick the strongest, Mercury, Mars, or Venus: the mind, the body, or the artistic sense. That's where your career would lie. That's about all he said about career. In this chart it's Mercury, so Lilly would say a life of the mind works best. That narrows things down a bit. OK so next we go to "honors." Same ruler as the ASC, and that ruler is placed in the 9th house. So the native (Mercury in Gemini) is known for (Gemini on the 10th) what comes from the 9th house (Mercury in 9). This would fit a philosopher, teacher, cleric - particularly a theologian, world traveler, journalist or any of the jobs associated with those fields that are less glamorous. It might also be elsewhere, but we are taught it should be within that framework. That's recognition. What about the mental illness that was spotted? Is there more we can determine about this? HINT: I'm not sure that there is, but there might be. 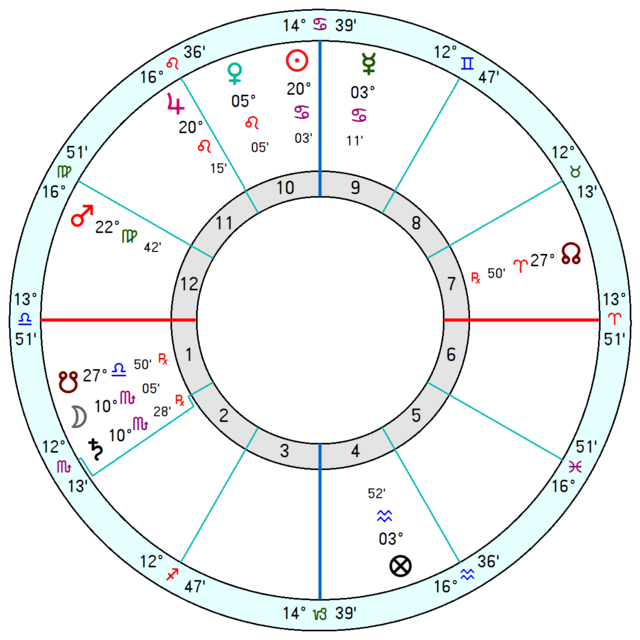 the illness is based on mars in 12th house,but by sign it is in the 1st.Still ,according to most classics Mercury linked to a malefic can bring mental problems. Try a different viewpoint, if you wish. 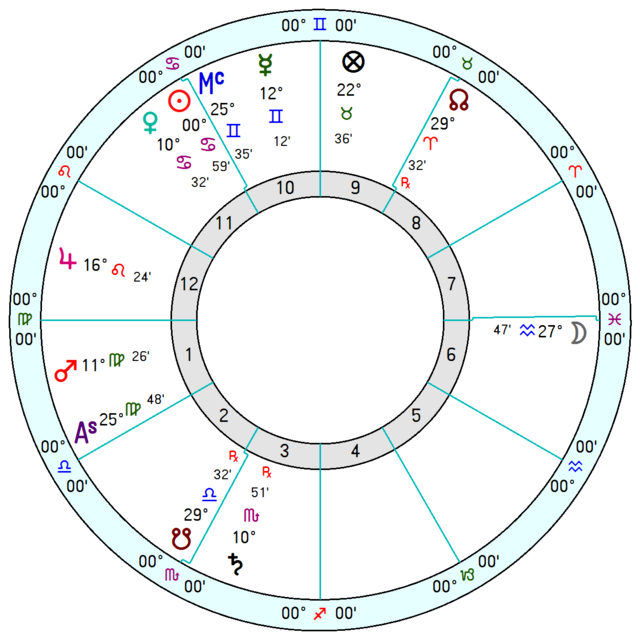 The following is the same chart, but using whole signs instead of the more typical Placidus. It does some interesting things. Indeed it does,assuming he is who I think. I`m beginning to veer towards whole sign houses. And for those who like secondary progressions, here is the progressed chart at age 20. Ages 21 and 22 can be eyeballed. If you put that Mars on angle ruling the 8th and the ASC ruler receiving it, then I would wager a short life and probably a violent death, so I would argue it does make a difference. Richie Valens didn't make it to 18 with Mars square ASC ruler from the 1st and received by the ASC ruler. Jupiter normally would mitigate the 1st ruler with a sextile a bit but it cannot from the 12th. Also, Saturn retro in the 3rd can be difficult to overcome, especially when young, and could stunt otherwise easy mental aptitude and you said this person is very intelligent. If career is unreadable, we could argue other areas are as well, so what is the point? I know plenty of people (in fact most of the people I know) who think astrology is hogwash altogether. Some people have clear relationship areas and the chart describes the partner even, while others have multiple partners and you cannot pick them all out. It is just the way it is - some charts are more focused than others. That doesn't make an area undecipherable entirely. There are a few things to say about this. Let's start with, "You're right," Died young. Violent? If we're thinking murder or accident, then no. But if we think a stroke is violent, and some might argue that, you're right again. The above clarifies the following point. If career is unreadable, we could argue other areas are as well, so what is the point? My objection is not that career is unreadable. I object to the idea that career is predetermined and can be pinpointed time after time. The chart is not that limited and our will is freer than that. The kind of career should be able to be determined or the characteristics of the individual that fit certain careers should be able to be determined. We've determined that this native is best suited for a career or profession that requires mental abilities. His small stature would render him unfit for more physical labor. But I don't think that we can look at a chart and say: A will be a doctor and B will be a nurse. We should be able to spot something in the chart that says "medical profession." But even that is no guarantee. There are probably plenty of people who have the necessary talents to become a doctor that never went near the medical profession for one reason or another. Our native, arguably, didn't have a profession or even a job. Does that show? Not really, or I can't find it. What does show is that his nature might have steered him to a particular kind of career. It's tougher to see if he took it up or not. I've given enough hints. I'll reveal the native later today.